One of the largest and most successful art clubs in the area is being revitalised. With an almost entirely new committee, under the leadership of Chairman Mike Daniels the Fellowship is aiming to blend the experience of the last 56 years with new ideas. The format of monthly demonstrations will continue in the afternoon of the first Wednesday of each month in the excellent hall at the Methodist Church in Lymington Road, Highcliffe between 14.30 and 16.30 hrs. Demonstrators in 2019 include regular artists such as Alan Langford and Lindsey Cole as well as newcomers such as Dee Cowell and Charlie Evans. Dates may be found in the Fellowship advertisement. 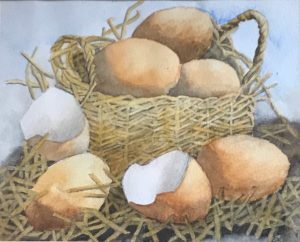 The annual exhibition runs for 3 weeks from 31st July to 19th August and is also held in the Methodist Church Hall in Highcliffe. It is for many the highlight of the art year. Fully paid up members can exhibit their work to fellow members and the general public with many people planning their visit to the area to fit with the dates that the exhibition is on. The planning and preparation for the exhibition starts in March and is led by Richard Adams, Exhibition Co-ordinator, who is supported by a substantial team of volunteers. In order to better meet the needs of members and provide up to date information about the Fellowship the Web site is undergoing a major revamp lead by our newly appointed Web Coordinator Ian Game. The new Web site address is www.Highcliffe-art.info. To encourage young people to become interested in art the Fellowship also runs an annual competition with a local school to select and recognise a ‘Young Artist of the year’ with the award being presented to the winner at the opening of the annual exhibition. Membership enquiries may be made to either Sandi Hills at 01425 613569 or hafsandi@gmail.com or Mike Daniels at 01425 501342 or mikejdaniels@hotmail.co.uk. The club has 150 members. Most paint themselves, others have an interest in art. Members pay just £20.00 per year (January to December), for which they may attend all the meetings and may also exhibit at the annual exhibition. Members may borrow DVDs and a selection of books. Except in special circumstances, members are required to attend a minimum of 4 meetings per year. Members are encouraged to help in the running of the club. If you’re interested in joining, please click on New Members on the left. The meetings usually feature a demonstration by a professional artist. The programme of speakers is carefully planned to ensure a wide variety of subjects, styles and media. For details of this year’s programme, click on Monthly Meetings above. which may be borrowed by members. The interval tea break enables members and visitors to socialise and chat with the demonstrator. Visitors are always welcome for £3.00 per visit. The annual exhibition is held over almost three weeks at the height of the summer holidays. The Committee are all volunteers. If you would like to contact any of them, please select Contact on the left. The best parking for the Methodist Church Hall is to be found behind the Co-Operative store on Lymington Road. The main entrance is accessed via Wortley Road. It is about a 5 minute walk to the Hall, either along Wortley Road or along Lymington Road. Parking on Wortley Road itself is for one hour only.